Ask and ye shall receive Richard Actually I thought I had posted this ages ago here, but hadn't it turns out. The primary set is 4901. 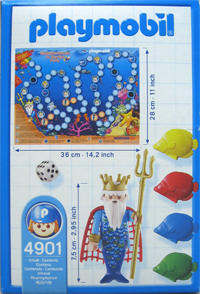 It includes the playing board with instructions, a die, a Sea King figure, and 4 fish playpieces. 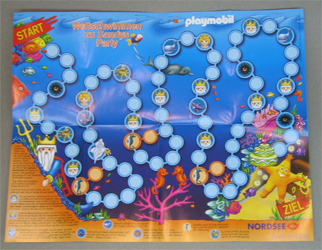 From what I understand from the instructions the starfish is having a party and invited his fish friends, the goal being to get from the beginning to the party. 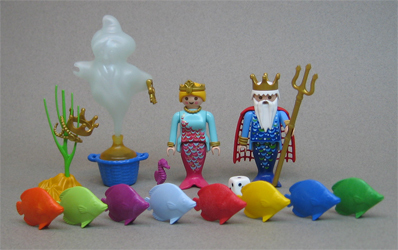 There are some characters here which I assume are from the Nordsee company as well as the figures from the three sets shown in this review. There are two more components for the game available for purchase. These are the equivalent of add-ons and come in a plastic bag. They have no set number anywhere on them and there are no part numbers in any of the sets. 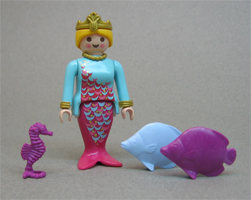 They contain an additional figure with accessories and two additional fish playing pieces. The third component is a bit odd but I like it anyway. 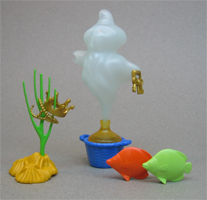 Here is a final photo of all three parts together. I really like this set. The additional sets you can purchase make it more extensive than the previous games. 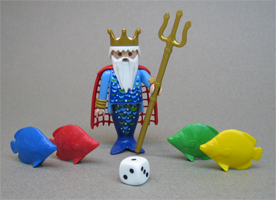 Most of the games produced have been similar in gameboard and styling. Fortunately for me they tend to feature unique colored animals. Except the last one - colored traffic cones??? And how do you play the game? Durrrrrrrrrrrrrrrrrrrrrrrrrrrrrrr! I missed the bit at the end of Tom's first post! They do look much nicer out of their packets. I think Tim's skill with setting the pieces up and photographing them has made them look quite irresistable. I love the coloured fish, especially. I didn't realise that there were 8 different ones until I saw these pics! 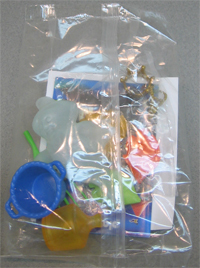 Nor did I realise that the bagged sets are like add-ons to the boxed game. 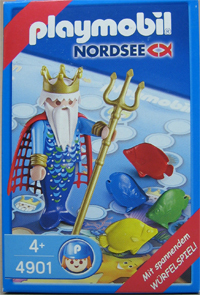 Quite a clever way to market them, as it meant you had to go back and buy more fish meals in order to complete the set. Thanks for the review, Tim. Sorry, Richard and Sylvia. 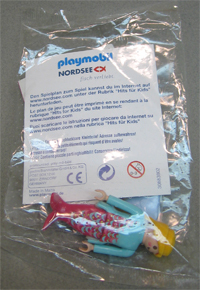 I will count you in for the next Nordsee Special, if you want it or not.